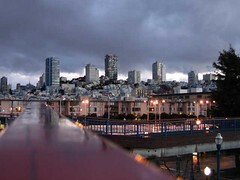 Interesting Picture we got of the San Francisco skyline. A couple of months ago I saw this awesome demo of a multi-touch input screen demo on Slashdot - The Ultimate Dual-Hand Touchscreen. Needless to say I was amazed and blown away by the reality that a lot of new and innovative interfaces could actually be this close. Remember the interface used in Minority Report, well it demonstrated a similar style interface to that. Then I was trying to remember it this week and telling a co-worker about it, and Rembrandt how awesome it actually was and what it could actually mean for things we could see out in the next couple of years. So I went digging and found one site that had the video and a number of tidbits that people have collected together on it at http://multi-touchscreen.com/. I sat and watched the whole video again twice tonight, in amazement and wonder of what might be reality in the next couple of years! Now for some details that I saw in browsing and reading about it. Multi-Touch Sensing through Frustrated Total Internal Reflection pretty cool demonstration. A Very interesting area and I plan to keep track of it as time goes by and when I can figure out a way to justify it I'm getting one for my computer! Interesting Spectrum Analyzer for the Wi-Fi spectrum. It is a USB dongle with a CD that is runnable under windows as well as software for running under Linux. The neat thing is it's only $99. It give you an interesting look at the Wi-Fi spectrum. Ever wonder why a program just runs slow on your machine and just fine on other machines? This Programming contest actually encourages people to make programs that run just fine and even pass light code review to be correct but take a looooooonngg time to run on another platform. Go check it out for a few chuckles. Self explanitary title. Just checking this out. One podcast that I have really enjoyed since I found them is Intellectual Icebergs. Intellectual Icebergs: helping to reveal the geek god inside of you! I've been asked to consider attending. Just had a request by a friend to see if I remembered any software that would allow you to explore relations graphically and drag them around on the screen and see the relations dynamically. After a bit of digging I remembered where I had seen it before. It was the old pmbrowser for exploring category research citation chains, and related documents. After a bit more digging around I ran across what looks like the core functionality at http://www.touchgraph.com.